Uncovering the dark side of the Nordic rune stones hidden beneath their traditional interpretation, Swedish scholar and runologist Thomas Karlsson examines the rune work of Swedish mystic and runologist Johannes Bureus (1568-1652) and professor Sigurd Agrell (1881-1937), both of whom devoted their lives to uncovering the secret uses of rune stones concealed from all but the highest initiates. Karlsson begins by examining the Uthark system of divination--the Left Hand Path of the runes--that lies hidden under the traditional Futhark system. According to the lore of Uthark, a cryptographic ruse was used to make it impossible for the uninitiated to know the true order of the runes. Exploring Agrell’s decryption of the Uthark system, Karlsson reveals similarities between the numerology of ancient mystery cults and the Runic tradition. He explains the multidimensional meaning of each rune from the Uthark perspective, their relationships with the nine worlds of Norse cosmogony, and the magical powers of rune-rows and the three aettir rune groupings. He details how to create your own magically-charged runes, direct and activate the force of the runes, and use them for rune meditation, divination, sigil magic, galders (power songs), and rune yoga. Karlsson also examines the secret dimensions of the 15 “noble” runes, the Adulrunes, based on the theories of Johannes Bureus. Using his knowledge of the Cabbala and alchemy, Bureus created magical symbols with the Adulrunes as well as one symbol containing all 15 Adulrunes, which Bureus called the “Adulruna.” Karlsson explains Bureus’ spiritual system of initiation, the Gothic Cabbala, revealing the connections between old Norse wisdom and the Cabbala. He explores Bureus’ Adulrune practices and explains how Bureus outlined seven levels of meaning for each rune, with those initiated into the highest rune levels able to conjure spirits and raise the dead. 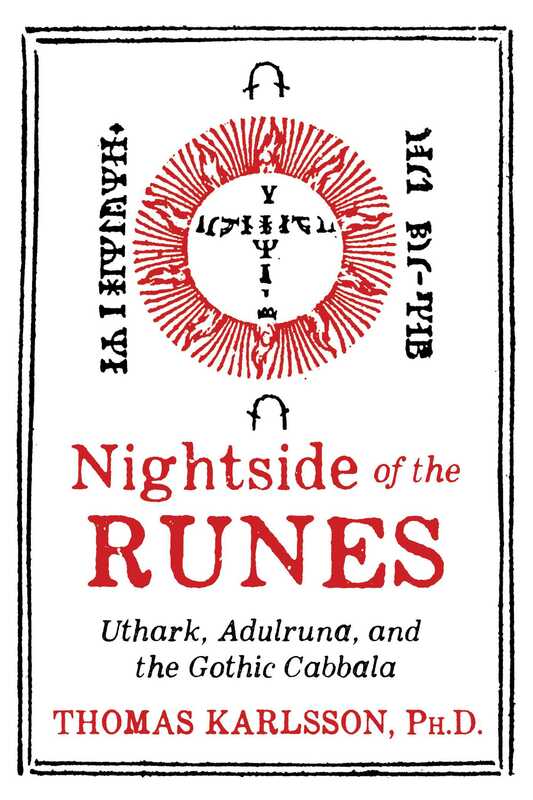 Covering more than just rune practices, Karlsson’s exploration of the dark or night side of the runes provides a comprehensive guide to Norse spirituality and the ancient spiritual mysticism of Odin. Johannes Bureus (1568-1652) made invaluable efforts for the Swedish language and runology, but he himself thought that the Adulruna and the Gothic cabbala were his most meaningful contributions to the future world. Bureus traveled around Sweden on behalf of the Swedish king and wrote down information about runic artifacts. Bureus believed that the runes were letters for writing but also esoteric, magical symbols. He was inspired by the Qabalah and alchemy and read the works of Agrippa, Paracelsus, Reuchlin, and other writers of occultism. Through a comparison with the Qabalah he became convinced that the runes had different dimensions. Bureus called the secret dimension of the runes adulrunes or “noble runes.” He removed the last rune in the Scandinavian rune-row and described a 15 stave rune-row divided in three ættir (groups) with five runes each. The three ættir were the principle of giving birth (SW:födare), the birth (SW: födelse), and the foetus, that which is born (SW: foster). Bureus believed that the runes had been created in ancient days by a mythical figure named Byrger Tidesson. Bureus wrote a runic ABC-book and wanted the Swedish people to return to rune writing once again. This gained a certain popularity among Swedish officers who used runic writing in secret messages during the Thirty Years War (an international war of Protestant against Catholic, fought from 1618 to 1648). Bureus created magical symbols of the adulrunes. They existed on something that he called “the falling stone,” a symbol that revealed a cubic stone of which three sides are revealed, each depicting five runes in the shape of a cross. He also constructed a symbol that he called “adulruna,” which contained the fifteen adulrunes. The symbol can be compared to the Monas Hieroglyphica by John Dee, which contains all symbols of the planets. The adulruna of Bureus is a map of the universe and of man’s progression through different levels of existence. The symbol as an idea is related to the Otz Chim of the Qabalah, the tree of life, and can also be a symbol of the Yggdrasil. The adulrune works both as a symbol of man and of the universe, the microcosm and macrocosm. As a center in the symbol is the Hagal rune, which according to Bureus means “noble” and is thus a pivotal adulrune. The Hagal rune is in the same way essential in later rune magic. Hagal has been associated with hail or with a seed that contains the other runes. In the adulruna of Bureus there is a path of hermetic progression. He developed a cross of adulrunes where the vertical line describes the progression of the adept. The adept is heightened above the darkness of ignorance tenebræ, through spendor, lumen, lux, luminare, and modus entis to principum absolutæ primum. The last principle is equivalent to the Ain Soph of the Qabalah. The highest is represented by the God rune that represents the spirit and the One. This corresponds to the Thor rune (Thurs) in Bureus system and to Bureus Thor represented the highest deity. The lowest level is the material and dualistic plane that is symbolized by the horizontal Birch rune called Byrghall. The goal in Bureus system is not to escape the lower level but to unite the high with the low, spirit with matter. The unification is symbolized by a rune where the two principles have become one. Bureus constructed different runic sigils that described certain alchemistic and occult processes. From his rune-cross he developed a magical symbol that contains seven of the pivotal adulrunes. The runes on the falling stone are constructed according to the same principle with five adulrunes where one is in the center, with two toward each other reversed are at the sides and one rune is above and one below. The symbol with the horizontal Birch rune (Byrghall) with the Man rune below can be interpreted as man and the divine archetypal plane that has been separated by matter and the plane of duality. On each side is the upward-flowing rune and the downward-flowing rune. The symbol corresponds to the qabalistic and hermetic world picture, and the description of man in Tantra. Bureus, with the combination of the God rune with the Byrghall rune, revealed that the secret of the goal with the adulrunes was the unity of The One and the level of dualities. This fact makes his system correspond to the draconian philosophy where the serpent and the eagle are united in the dragon, or where Shiva (The One) is united with Shakti (Duality) without the disintegration of any of the principles, but rather enabling the creation of the third, the synthesis. The system of Bureus is called the gothic or götic Qabalah, and also the Uppsala Qabalah, cabal Upsalica. If we, like Bureus, would consider the thought that there were obvious connections between the old Norse wisdom and the Qabalah, is it then possible to place the worlds of the Yggdrasil on the Sephiroth? This can surely be done if we in the same symbol will include its dark side, since the Nordic worlds are both light and dark. Thomas Karlsson, Ph.D., is founder of the esoteric order Dragon Rouge and Head of Ordo Draconias. He is senior lecturer in history, religion, and philosophy at Stockholm University, fellow researcher at Yale University, and director of the Esoteric Crossroads conferences in Capri, Italy. The author of Cabbala, Qliphoth and Goetic Magic and Amongst Mystics and Magicians in Stockholm, he lives in Tumba, Sweden.